The Blackhawks felt it was time to move on, the Panthers decided to capitalize on it. 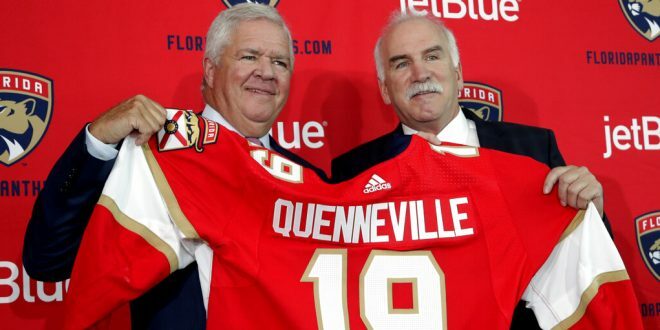 Just in time for the Stanley Cup Playoffs, the Panthers found their way into the headlines by hiring Joel Quenneville as their new head coach. After going through 15 head coaches in 25 seasons, the Panthers may finally have found their answer to success. Quenneville spoke about the beginning of the next chapter in his coaching career. And that header is an understatement. In 22 years as a head coach, Quenneville has reached the playoffs 18 times. His most notable run was with the team that just fired him. During his time with Chicago, the Blackhawks won the Stanley Cup three times in six seasons (the first victory was the first Cup for Chicago since 1961). Under Coach Q, the Blackhawks completely turned the team’s history around. It is safe to say that there is a need for change. And that change could be coming very soon. Quenneville says he sees parallels between the Panthers and 2008-09 Chicago Blackhawks. Keep in mind the team that Coach Q is comparing the Panthers to was one year away from winning the Stanley Cup. The team definitely has the talent to compete. Three players scored 30 or more goals last season (Hoffman 36, Barkov 35, Huberdeau 30) and Evgenii Dadonov was only two goals short. Goaltending can be a bit problematic, especially when Roberto Luongo has the worst season of his career. At age 40 it’s hard to say he’s due for a bounce back but three years on his contract left anything is possible. In 2009, no one saw the Blackhawks as legit but by 2015 the name made any opponent nervous. 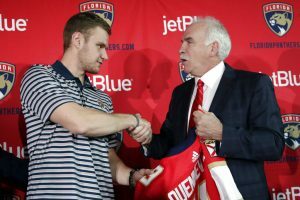 Perhaps it’s possible that the sports world will be saying the same thing about the Florida Panthers come next year’s playoffs.